North Carolina Wildlife Federation supports wildlife habitat garden and restoration programs unique to the flora and fauna native to our state. Since 1973, the National Wildlife Federation’s Garden for Wildlife program has been educating and empowering people turn their own small piece of the Earth - their yards and gardens - into thriving habitat for birds, butterflies and other wildlife. Together, NWF and NCWF realize every habitat garden is a step toward replenishing resources for wildlife locally and along migratory corridors. 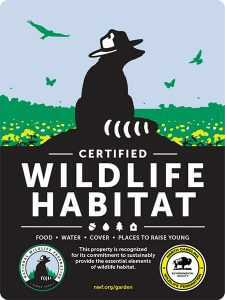 Recognize your commitment to wildlife and certify your yard, balcony container garden, schoolyard, work landscape or roadside greenspace into a Certified Wildlife Habitat®. It's fun, easy and makes a big difference for neighborhood wildlife. In addition, your application processing fee of $20 supports the National Wildlife Federation's programs to inspire others to make a difference and address declining habitat for bees, butterflies, birds, amphibians and other wildlife nationwide. A portion also supports the work in our state!